We have beautiful French fillet beans coming from the farm! The key to cooking fresh green beans just right is to parboil them beforehand. This will soften them and prepare them for the saute. Bacon and green beans are a match made in heaven in this dish from Real Simple, but the mustard and vinegar give it complexity and kick! Do you think trimming green beans is a time waster? 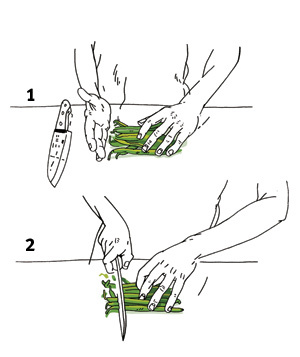 Check below the recipe on how to trim 2 pounds of green beans in a snap! Bring a large pot of water to a boil and add 1 tablespoon salt. Add the green beans and cook until just tender, 4 to 5 minutes. Drain and run under cold water to cool; transfer to a serving bowl. Meanwhile, in a medium skillet, cook the bacon over medium heat until crisp, 6 to 8 minutes; transfer to a paper towel-lined plate. Let cool, then break into pieces. Remove all but 2 tablespoons of the bacon drippings from the skillet and return to medium heat. I like to pour all of my bacon drippings into a jar to save for adding a hint of bacon flavor to other dishes in the future. Don’t throw it out! Add the shallots and cook, stirring, for 1 minute. Stir in the vinegar, mustard, oil, ¾ teaspoon salt, and ¼ teaspoon pepper. Add to the green beans, along with the bacon, and toss to combine. You only need to cut off the stem end, where the bean attached to the vine. The other end if fine to eat. Line up the stems. Sort the beans so that the stems all face one direction. Scoot a handful against your palm so that they’re even and then chop them all off in one go! With this method you’ll be getting through a whole bowl in just a few minutes!